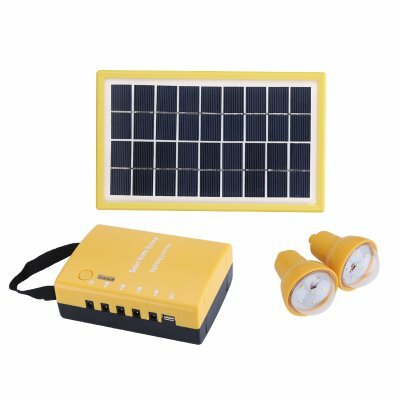 Successfully Added Portable Solar Energy Kit - Two 1.7W Solar Panels, 2 Rainproof LED Bulbs, 4500mAh Rechargeable Battery to your Shopping Cart. This portable solar lighting kit is a great way to set up outdoor or indoor lighting at zero cost. Coming with two 1.7W solar panels, 2 weatherproof LED bulbs and a 4500mAh rechargeable battery. The solar energy kit is a great energy-saving solution for indoor or outdoor lighting systems. Easy to set up and with zero electricity consumption, this mini system will let you save money on bills while not sacrificing lighting quality. Plus, you will also be able to charge up small gadgetry. The kit gives you everything you need to set up an independent lighting system. You will have two solar panels at 1.7W each, two 0.9W LED bulbs, a 4500mAh rechargeable battery/power bank and all the needed cables and connectors. The two LED bulbs come with IP54 rating and are rainproof. This makes the portable solar lighting system a great comprehensive solution for outdoor lighting. So, if you would like to have a well-lit property after dark: terrace, backyard, swimming pool area or driveway – with this solar system you will get this all set up without racking up your bills. The portable solar energy kit is environmentally-friendly and comes with zero emissions. It’s clean and economical way to have indoor or outdoor light and does not require expensive maintenance. The Portable Solar Energy Kit comes with a 12 months warranty, brought to you by the leader in electronic devices as well as wholesale portable solar energy kits..